We’d love your help. Let us know what’s wrong with this preview of Whisper of the Tide by Sarah Tolcser. For now, Caro is landlocked, helping Markos reclaim his throne after nearly his entire family was assassinated in a political cou Caro Oresteia spent her life waiting to be called by the river god, as those in her family had been for generations. But when she’s swept away on an adventure to save the Akhaian royal prince, Markos, her destiny is sealed by the sea god instead. To ask other readers questions about Whisper of the Tide, please sign up. Is there a third book? Sara No, this is a duology. Ahhh this series is a lot of fun! It's so imaginative and honestly feels like a movie playing on the page?! All the pirates and sea drakons and rum and petulant princes and badass female captains. 😍This is the content I'm here for, okay? Okay. Admittedly I did love the first book better and I wish I'd had time to reread it before starting this one! There were exactly 98938 people I really had no idea who was (I REMEMBER YOU, CARO, MY LOVE.) And also Caro and Markus' storylines diverge in this one Ahhh this series is a lot of fun! It's so imaginative and honestly feels like a movie playing on the page?! All the pirates and sea drakons and rum and petulant princes and badass female captains. 😍This is the content I'm here for, okay? Okay. Admittedly I did love the first book better and I wish I'd had time to reread it before starting this one! There were exactly 98938 people I really had no idea who was (I REMEMBER YOU, CARO, MY LOVE.) And also Caro and Markus' storylines diverge in this one...which means, yup. Next to know snarky sassy bickering banter. 😭Honestly that gave me LIFE in book one and I sorely missed it. Caro is SUCH a fantastic narrator! I continue to adore her! I like how she was learning about serving the sea god in this one, and also figuring out who she is + how that can mesh with Markos. OR CAN IT MESH WITH MARKOS???!?!? As the blurb says: there's a bit of a twist with Markos now needing to marry someone else to get allies and an army. And Caro is absolutely a nobody, sooooo. This is awkward. There's definitely a lot packed into the plot! It starts off pretty slowly, but the ending is like BAM BAM do u still have feels dear oh BAM BAM. So that was fantastic. I'd be lying if I said I wasn't wholly enjoying all the YA pirate fantasy fiction that's being released, and the Song Of The Current series consistently has the most gorgeous covers. 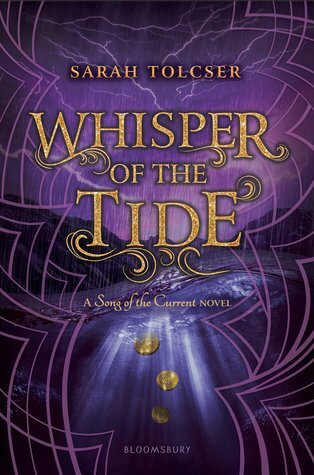 The first book in the series was a solid debut to an intriguing twist on some of the ancient folklore in the genre, and I felt Whisper Of The Tide was just as solid of a sequel. The story continues in the following of a strong female protagonist, and this plot also features mystery, action sequences, and just enough romance. There was a satisfying wrap-up to most of the threads that were left open in the first novel and upon finishing the book I realized just how much I've enjoyed reading about these characters, and also just how much I'll miss them again. Highly recommended to fans looking for another pirate fantasy adventure, but definitely start with Song Of The Current to keep from being confused and spoiled for the many twists and turns. Not to brag but I've already read an early version of this and it's super satisfying and super fun. Maybe 4.5 stars, but I loved it! Just as in Song of the Current, Caro & Markos's banter & chemistry lit up the pages. I really like that Caro carves out her own fate from the expectations and demands everyone else places on her. Full review to come. *crying* LOOK HOW BEAUTIFUL THAT COVER IS HOLY COW! I'm about halfway through Song of the Current, and the way it's going, I'm going to need the sequel ASAP! Join Caro as her adventure continues with the emparch, Markos, who is continuously being attacked as he attempts to get his country back. Caro starts to question who she is and her purpose as she struggles with the idea of being emparchess and parting with the sea. This swashbuckling romance will keep you turning pages to the very end. From the very fi ARC received from the publisher via Netgalley for a fair review. From the very first chapter till the end I loved following Caro as she discovers who she is and what she really wants to do with her life. I couldn’t help cheering Caro on while she struggled with her star crossed love life that just didn’t want to be harmonious with her sea life. Even though much of the story the characters were struggling to just stay alive or were fleeing capture, the story still had a plot and direction. If you’re looking for an action packed pirate adventure then I would say check this series out. Between the love story, actual pirating, a treasure map, and being cast away on the island you are sure to be entertained the whole way through. There is so much more ship jargon in this book. I loved it in the first book with the wherries, and I loved it again in this book. It’s not an overwhelming amount that if you don’t know the directions on a boat that you wouldn’t be able to understand, but having the language there helped bring the feel of the ship to life. It was fun to learn a little bit more about the favoritism of the various gods, but not to the point that it took away from the adventure. I love that the ocean god has a snarky attitude that fits with Caro’s. We also get a little bit of fun with more of the shadow magic through Kente (winner of cousin of the year for being so faithful to Caro). Though at times I thought the shadow magic ended up being a little too convenient, I appreciated that it wasn’t 100% fool proof and that there were still obstacles that interfered with it’s capability. This book made me want to watch the first two Pirates of the Caribbean’s. You know when they were still good. The dynamic of Caro and Melanos just reminded me so much of Elizabeth Turner and Jack Sparrow. I thought their trust/hate relationship really helped drive the story along, as you tried to decide if Melanos was going to be a bad guy or not by the end of the book. I was a nice way to keep you on your toes. Caro has this selfishness that she has to overcome where all her decisions seem like they’re about what’s best for Markos, but at the same time she just wants a bit of everything. I loved that she just didn’t have everything figured out, and was willing to make some sacrifices in the end. Honestly, I was a little hesitant to start this one. I liked, but didn't love the first book . But I must say, I was pleasantly surprised by how easy it was to get into this sequel! The elements that I enjoyed from the last book were still in play: Caro being full of awesomeness, her banter with Markos, and the atmospheric world building. There's a ton of at-sea adventure in this book, and Caro sailing feels so, so right. But there was definitely more at stake in this book. It seemed much less "safe" than the first, which was actually my biggest gripe with Song of the Current. So for this to seem a bit more urgent, more dangerous, made it a much better read for me. In fact, I was pulled in almost immediately by the direness of it all. The plot never lagged for me, and I was engaged the whole time. There's also some new/better-fleshed-out side characters in the mix that made the book all the more enjoyable. One of my favorite aspects of this book is Caro's relationship with a villain of sorts- to say anymore would be spoilery, but it was fabulous. The banter and snark that we've grown to love comes out in full force. The only thing I wasn't totally thrilled with was a bit of predictability and a little bit of "lack of communication" trope from our romantic duo. The ending, if it is the ending of the series (I have no idea, but it seems to be only the two books for now?) is definitely satisfying. So if it remains a duology, I think readers will be quite pleased with the direction this book takes. I really enjoyed the sequel much more than the first book. You can really tell the author has grown and feels incredibly more confidant within the world. Instead of having to focus on the world building, we were able to focus on the characters more and their struggles. The plot certainly took a completely different direction than I thought, which was GREAT! I was thinking this story would lose its nautical tones and influences, but it ended up being the exact opposite. The return of one of the most complex characters from the first book I think had to be my favorite part. He was hysterical, and I couldn’t stop grinning the entire time. I have so many jokes marked off in the ARC because he’s just so funny! I also enjoyed watching the maturation of Caro because she was very insecure even at the end of book one. It was a gradual and nice change because people certainly do not change with the snap of their fingers. Her relationship with Markos also felt more real if that makes sense. It was really genuine and sweet. By the way the villains in this story are so numerous and so evil, and I LOVED IT! I was shaking my book in anger and betrayal so many times- I’ve lost count now. My fangirl screams certainly are seen in my Instagram story haha. The cover is beautiful and I love it! Remember a time, not so long ago, when “Pirates of the Caribbean” was actually acclaimed and not a national joke? I mean, those first few movies were a blast! I may, may, have even seen the first one in theaters three times. I remember being almost giddy over just how much unadulterated, unquestioned fun that first movie was offering up. Adventure! Romance! Great characters! And some top notch humor that the other films never seemed to really understand or replicate in all the many, MANY, iterations that followed. So you can imagine just how thrilled I was when I discovered about halfway through this book, that “Whisper on the Tide” was essentially what you’d get if you took that first movie and then took Kiera Knightley’s character from the third movie, but actually made her, you know, a good character and had her run the show. While Caro has finally discovered her true calling, with the goddess of the ocean in her ear and a ship to her name, her time of late has been spent decidedly NOT at sea. After pledging herself to help Markos regain his lost throne, she’s recently discovered that much of what this help is made up of is running a few messages here and there and sitting through various speeches and rallies while Markos looks to drum up support for his cause. And all is not going well. The ocean god is displeased with Caro’s lack of sea time adventures and Markos few followers are pushing towards a marriage of convenience that would bring in much needed support. Caro has more and more difficulty seeing a path forward that allows her to keep both of her loves, the sea and Markos himself. For all that the description of the story, both mine and the official one, puts a lot of weight on Caro’s decision about her future, part of what has made me like this series so much so far is Caro’s no nonsense approach to life and decision making. She doesn’t wilt away from tough choices and she is endlessly practical. In many ways, she sees her ability to make hard calls as her biggest asset to Markos, whom she often derides as getting too caught up in the emotions of things. Here, these character traits move the story along and keep it from being marred in the emotional duldrums of soap opera-ness that could have come about with a different character in this situation. But what makes it all the better is that through this book, Caro must learn that her own practicality and willingness to follow the harder path is not always a boon. In short order, she’s back out on the ocean and beginning to understand how very little she knows of life as a sea captain, for all that she has her own ship and the ear of the sea goddess. The action never lets up and Caro’s adventures are filled with everything you’d want from a pirate adventure. We have storms, and ships sinking, and maroonings on islands, and lost treasure, and pirate lairs. Really, like I said at the beginning, all the best parts of the “Pirates of the Caribbean” movies, though each with their own unique spin and connection to the larger plot. For secondary characters, we sadly saw much less of not only Markos, but Caro’s magic-wielding cousin, Kente, was also out of commission much of the time. But what we did get from her was integral to the plot, and I liked the the fact that she had a role at all, as with the way the last book ended, I wasn’t sure we were going to see more from her. Markos, also, was abscenfor much of the middle portion of the book. I was ok with this. I still very much enjoyed the romance between him and Caro, and their banter and Markos’ own cluelessness about certain things were still some of the most fun pieces of dialogue in the story. However, by sidelining him and their romantic entanglements, Caro was given the space and time to really come into her own as a character and drive the plot on her own. This also gave room to add a surprising new (?) character who I had not expected to see at all. I don’t want to spoil it, but I thoroughly enjoyed this addition and the character added a much needed sense of ambiguity and moral greyness to an otherwise fairly straightforward adventure story. To continue the “Pirates” compariosons, if Caro is Elizabeth and Markos is Will, this new character was Jack Sparrow and lived up to the utter delight that any character should be if trying to fill that role. I also greatly enjoyed the expanded idea of Caro’s relationship with the sea god. While we heard a lot about the river god and the solid, calm prescense that he transferred to those who were chosen by him, we only briefly met the sea god in the last book. And true to the nature of the sea, she is much more volatile and unpredictable than the god of the river seemed to be. I was relived that she wasn’t reduced to just another magical ability for Caro, but given her own agendas and whims that often came into conflict with Caro’s. Their ongoing battle of wills was a large secondary driver of much of the story and I was very pleased with how it played out. In the end, I enjoyed this book even more than the first. While “Song of the Current” had a slow start, this one jumped right into the action and never let off the gas pedal. Caro was her same sassy self, but was given more room to proactively drive the plot herself this go around. I still very much enjoyed the romance, but was pleased to see that it played second fiddle to the action and adventure. And between the ocean god and the surprise Jack Sparow-esque character, there was enough double crossing and cross purposes to keep readers on their toes about what would be coming next. If you enjoyed the first book, I’m sure you’ll love this one! WHISPER OF THE TIDE was a stunning sequel! I came in with high expectations, but was honestly ready to give it a 3 star midway through the book, no joke. What changed my mind? I could say that the events that happened were pretty awesome, or the resolution was sooo satisfying and lovely, or how the stuff that had me side-eyeing were properly addressed. But I think plain and simple, Tolcser breathed life into Caro’s character and made her resilient, flawed, and just great in genera IT WAS SO GOOD! WHISPER OF THE TIDE was a stunning sequel! I came in with high expectations, but was honestly ready to give it a 3 star midway through the book, no joke. What changed my mind? I could say that the events that happened were pretty awesome, or the resolution was sooo satisfying and lovely, or how the stuff that had me side-eyeing were properly addressed. But I think plain and simple, Tolcser breathed life into Caro’s character and made her resilient, flawed, and just great in general. I adored her from start to finish, mistakes and all. And I hope fans of the book come into WHISPER OF THE TIDE with an open mind and heart to Caro’s flaws. The book follows Caro’s first person POV as she tries to help Markos overthrow the rule of Konto Theucinian, who has a strict regime as monarch (or Emparch, as they are called here). Both Markos and Caro are on Theucinian’s hitlist, and much of the action comes from assassination attempts and being on the run. Markos is trying to get supporters to place him on the throne, as his father was the Emparch and was killed when Theucinian took power, but many people call him the Pretender and are too afraid of Theucinian to support him. The interesting part of this particular plot is that it’s there, but not the main focus. Theucinian is a force that’s unseen throughout the book - his actions are done through other characters and thus made for an uneventful protagonist. “‘When we make a promise to serve, sometimes that promise is hard to keep. Whether you serve a god or an Emparch.’ He nodded at me. Caro’s life was flipped upside down after meeting Markos and getting embroiled in the politics of the land. She found out that she was one of the chosen by the sea goddess, even though she grew up calling for the river god. Additionally, she wants to explore and travel, but stays in the city near Markos to help him with his campaign. Because of this, doubt and restlessness emerges, creating a confused main character who doesn’t know where she fit in. I really enjoyed this particularly piece of introspection because her obvious insecurities made her stand out as a character, even as she puts up a strong and fierce front. The plot thickens when Caro pushes Markos to marry another noble that will help him with his campaign. At the same time, she defies the sea goddess and becomes stranded in an island with an unlikely ally. Or is it enemy? With that, the fun begins. I thought that I would really dislike the romance in this book. Both Caro and Markos don’t know what they want, and whether to sacrifice their lives over duty. Since she pushes him away, they aren’t together for the middle of the book and I low key got annoyed with him. BUT. But, when they meet again, things are in the open. Hidden schemes are unfolding and they - mainly Caro - has learned a lot since they last met. I love how the author really makes good use of dialogue and communication to sort their relationship out. Yes for no misunderstandings! And overall, I thought they were a great couple with sweet chemistry and complementing hearts full of adventure. I really enjoyed the ending and how most plot points got wrapped up. Another great thing about this book was SOOO many women in power. It’s uncommon to see that in YA fantasies, and I loved seeing all these talented, ruthless, and creative heroines here. This book also features: mistaken deaths, fearsome sea monsters, a map to a long-lost treasure, and the taste of the sea. Tolcser writes a timeless ocean adventure that wanderlust readers will devour. Thank you Netgalley and Bloomsbury for the review copy! I don't remember doing this, so I think I fell asleep on my phone last night. EXCELLENT SLEEP, 5 STARS. AHHH, i love satisfying endings! a brilliant finale to a fun series. Mitigation emerges from Seventeen year old Caroline Oresteia was a privateer on board the Cormorant, alongside her father, a humbled Wherryman, now evading capture for her thievery upon the everglades of Kynthessa. Caroline is a tenacious young woman, her fortitude is inspiring. Altruistically, she is now assisting Markos as he attempts to converge military and political allies. Markos Andela is the legitimate Emparch of Akhaia, his family slain by Konto Theucinian and displaced from his kingdom. "You had to know what you wanted - but knowing wasn't enough. You had to be willing to fight for it. To be so strong even the sea could not defy you. That is how strong we must be, to keep the things we love." Last year, I read Song of the Current and I absolutely loved it. It was a great debut. When I heard there's a lost treasure hunt involved in this sequel, I'm so ready for it. Whisper of the Tides is not only a fun sequel but also a good conclusion to this series. I loved getting back into this world and meeting the characters once again. I quite enjoyed this book as much as the first one. It has a perfect amount of adventure, romance, humor, snark, and action but the one thing that made this whole journey a fun ride is definitely the dynamic between Caro and a certain Conniving Pirate. These duo reminded so much of Elizabeth Swann and Jack Sparrow from Pirates of the Caribbean. I loved their relationship and their snarky banters. Caro's adventure continues in this sequel where she helps Markos in his campaign and also becomes his protector to look out for any assassination attempts from their enemies. Markos is called pretender even though he's a legitimate heir to the throne. He needs an army to fight against Konto Theucinian, but no one wants to risk a war by supporting a young prince except for one Powerful Archon who is willing to support Markos’s claim to the throne if, in exchange, he accepts his daughter’s hand in marriage. Now Caro and Markos needs to decide which is important, their love or the throne. Caro always belonged to the sea and she never fitted to be an emparchess so she finally makes the painful decision for both of them which eventually leads Caro to another dangerous adventure. I loved Caro even more in this book. Her character growth was very well done. After the events in the first book, She was kinda confused about where she fit in and where her true destiny lies. She Struggled while making hard decisions but she always stood strong. She's not perfect and made mistakes but that's what makes her so real. Markos is a delightful character. He's always sweet, fun and charming. He's kinda secondary character in this book because he had less part in this book. I still enjoyed the swoony romance and fun banters between him and Caro. I liked Kente, Caro's cousin who wields shadow magic. She was there for her whenever Caro needed help. I really wish she had more part in this book because she's really an amazing character. I also liked the Snarky Sea Goddess who loves taunting Caro. And finally, we have a surprising new character in this book who stole the show. He's a great addition to the plot and I really didn't expect to see him again. He has an intriguing and fun personality. I really enjoyed his character a lot. I'm not revealing his name because it's kinda spoilery. If you like Jack Sparrow then you'll definitely love this guy. The plot was very interesting and engaging throughout. It has a slow start which I'm really not fan of, but after the mysterious shipwreck, I was hooked to the plot till the end. There were so many twists and turns in the book that kept me on the edge of my seat. The whole story felt like an adventurous ride. There's a lot of sea adventure in this book and I enjoyed every minute of it. The writing was pretty good, but to be honest I struggled with the writing in the beginning. The book was told in Caro's first person pov. I enjoyed reading the story from Caro's POV, but I think this would've been even more enjoyable if it was written in multiple POV's. The world building was amazing. It was one of the best aspects of this series. The world of riverlands is an enchanting world filled with magic, myths, gods and goddesses, sea creatures, and pirates. I wish we could explore more of this world. Overall, I loved this book! It's a total entertaining read filled with adventure, magic, romance, pirates, ships, and treasure hunting. The story wrapped up perfectly with a satisfying ending. I'm really gonna miss this world and the characters. If there's ever a spin off of this series in the future, I would definitely read it. I can't wait to know what the author has in store for us next. One of my favorite things about this book was the high-stakes feeling that was weaved into every chapter. The plot of this story kept me on the edge of my seat! I was always dying to know what was going to happen next and I was constantly clutching my chest in fear for my fav After reading Song of the Current, I was DYING to get my hands on the sequel! I am so excited that I FINALLY read it and it was so much fun! This book was full of adventure, badass moments, romance, banter, and so much more! What a thrilling sequel! I missed my subway stop I was so engrossed in this one- pirates and gold and danger and love and hard choices! I couldn't put it down. This review has been hidden because it contains spoilers. To view it, click here. Y’all. IT’S SO FREAKING GOOD!!! If you haven’t read it, better check it out. I’m crying, it’s just so beautifully well-written. It’s good to finally be back on this one hell of a sea adventure. The politics really grew so good, much better in my opinion. The throne, royal cousins, arranged marriage, finding treasures, and the sea god plan. All are connected. I was blown away by how the author keep the storyline consistent & made the plot so much better. Caro is back on her sea adventure, it wa Y’all. IT’S SO FREAKING GOOD!!! If you haven’t read it, better check it out. I’m crying, it’s just so beautifully well-written. I’m SO FREAKING HAPPY seeing Markos & Caro finally have their happy ending. These two has been separated lots of times since the first book. I cried when the arranged marriage thingy happened. I’m glad the marriage between Markos & Agnes aka Araxis came to an end. At least Markos & Caro are now free and can live a happy life together. Araxis Chrysanthe really made a good villain in this story. Although not as good as Cleandros. There are times when she doesn’t really appear as much as a villain, but still she’s a villain of the story. Pretended to be Agnes Pherenekian, married to Markos just to kill him under the order of her father, Konto Theucinian. I hate for what she’d done to Markos’ & Caro’s relationship and for poisoning Kenté. She’s so slick & very ruthless. I was hoping for Caro to at least slap her but knowing Caro, she’s too kind for that. An unexpected alliance from Diric Melanos. Wow, he indeed surprised me big time. He appeared to be evil in the first book, but after knowing him & hearing his side of the story in this one, he’s not as evil and bad as I thought. Pretty much my new favorite character. I hated him so much in the first book but in this one, he made me like him more. And damn...I didn’t expect the hint of him & Kenté. He truly fell for her. It would be nice to see him reunite back with Kenté. I love seeing Kenté & Caro going for their dangerous mission. These two ladies are the bravest characters in the story. They risked everything to help each other even in dangerous situation. Powerful cousins indeed. Never doubt their skills & ability in eliminating their enemies. This book takes place three months after Song of the Current and I am proud to announce that I was pleasantly surprised by it! I really wanted to like this book more than the first one and I'm so happy that's exactly what happened! It did take me a bit to get into but my interest was spiked about halfway in and I couldn't put it down after tat. I loved the new characters we were introduced to here. They were so interesting and they definitely drove the story forward faster than I expected and they made me appreciate Sarah's storytelling so much more. I also liked the way the relationships between some characters developed and changed throughout the pages. I was pleasantly surprised how a few of them changed and it was one of my favorite things to witness. Sadly, I was bummed that this was still almost as predictable as the first book so that is why I couldn't give it 5 stars. It took me a while to figure out but the main reason why it was so difficult for me to be interested in the story line was because I didn't care for the romance. I am always more interested in how the romance develops in the books I read but I struggled to attach myself to Caro and Markos. It was a huge point against it since some of the things happening centered around it to begin with. Fortunately, I ended up caring about it a little more by the end. A couple of things that happened between Caro and Markos made me tear up with giddiness so I liked that. It's always a good thing when an author changes my minds about things and that's exactly what Sarah did here. I can't even begin to describe how I have so much more respect for Caroline after having read this. Her character developed amazingly and I couldn't be happier with it. So while I was not blown away by the first book, I was still excited to see how things would play out for Caro & co. in the sequel seeing as the synopsis promises a lot of drama with a touch of angst. Just how I like it. And while the book did deliver that, I felt like there were definitely some things missing and other things that could have been explored further. Markos: A step up from what he was in book one. I am still not 100% positive he is book boy toy material, but I did appreciate his sacrifice and dedication to the cause in this book. (But that comes to a rather quick end, more on this later). Again, no real connection was there, but he was a good character and way better than what he was in book one. Melanos: Honestly, I am a sucker for the morally gray and those with redemption arcs. This man is by no means any “good,” but that redemption arc! He is one fiery and angry and sad pirate, people! He makes many poor decisions and his past is tarnished too, but I think Tolcser did a great job of showing the importance of asking for and extending forgiveness. On a funny note. One character had the unfortunate circumstance of being named, Dido. And I have a filthy mind. In this book, much more of the sea and land is explored which I thoroughly enjoyed. Tolcser was once again able to paint the distinct landscapes in their unique way that made each adventure the characters had more fun and dangerous. While we didn’t get to in touch with actual people of the land, there was a lot more development into the character of the sea god. She was not as benevolent as I thought she would be which was quite a pleasant and rude surprise! I really enjoyed the way Tolcser tried to antagonize her and yet make her a supporter of our heroine as well. I’ll just say that the gods, especially this sea god, likes to play games! While I was looking forward to the “We can no longer be lovers” story, I was glad it did not take precedence. Instead the characters went on a treasure hunt, which should be just as fun! The thing is is that as the story went further in, the focus shifted back to the romantic tension and the discovery of the treasure, while it had its action, was not a wow factor. I think I was just expecting a lot more from the discovery. The twists in the romance were kind of obvious, so I was hoping the treasure would hold a lot more pizzazz. It was fine, it had action, just not enough for me. Again, it’s not that I did not ship it, it’s just that I was not invested. Seeing as I could spot the twist in this little “marry the Archon’s daughter” charade, I found myself lacking in drama. The angst was there, but the drama, the scandal, the heartbreak. Meh. So this book just ends. The characters go off and live their lives and the end. No politics get resolved. There is still a bunch of problems in the world. But to Caro and Markos everything is all sunshine and happy endings. Let’s just say that there are plenty loose threads available for a spin off series, which I don’t know will happen. I am generally interested in seeing this political turmoil resolved so….I’m up for it, since I do not think there is going to be a third instalment. Overall, the book was okay. I enjoyed it a tad more than book one. I thought it had a great adventure to it, and even though I was not super invested, the romance was sweet. I had hoped for a bit more action and twists. There were not too many heart-pounding moments. Still, I did enjoy reading Caro’s journey in self discovery and forgiveness. Whisper of the Tide brings readers back into Caro's world of gods, rebellions and piracy. Despite having promised Markos she would sail for him, Caro is beginning to feel stuck and unsure of who she is. As Markos' efforts to raise support for his campaign to take back his throne continue to stall, Caro is faced with the possibility of losing him for good. I thoroughly enjoyed book one of this duology, The Song of the Current. I hadn't read anything like it and Caro was such a great protagonist t Whisper of the Tide brings readers back into Caro's world of gods, rebellions and piracy. Despite having promised Markos she would sail for him, Caro is beginning to feel stuck and unsure of who she is. As Markos' efforts to raise support for his campaign to take back his throne continue to stall, Caro is faced with the possibility of losing him for good. I thoroughly enjoyed book one of this duology, The Song of the Current. I hadn't read anything like it and Caro was such a great protagonist to follow, add pirates and it was a whole lot of fun. Whisper of the Tide brings all this back along with a good deal more pirating. Reading Whisper of the Tide I found the pages flying by. I would put it down to pause only to pick it right back up because I couldn't stop reading. The beginning did start off a little slow as the focus was on Markos' political manoeuvring as opposed to adventures. I was a little worried at this point that I wasn't going to enjoy this books as much as the first, however things slowing began to pick up. Then, around the 100 page mark, the fun really began and didn't let down for the rest of the book. I loved the return of some side characters, one return in particular I really enjoyed, though it wasn't what I had been expecting and they weren't unchanged. Tolcser played with the themes of forgiveness and guilt really well here. Something that I really loved about Whisper of the Tide was how pirate-y it was, It was just so fun! This book was both easy to read in the sense that it swept you away as well as being filled with complicated twists and turns. None of which I saw coming. I think that was one of the best endings I have ever read. I won't spoil it but I in no way so it coming but I absolutely loved where each character ended up, it was such a satisfying conclusion. I highly recommend both books in this series if you want a solidly enjoyable series, filled with great characters, adventures and pirates. This was a wonderful end to such an adventure! I'm applauding Sarah Tolcser for creating an enchanting world full magic and adventure with a full cast of flawed diverse characters. If you're looking for adventure, politics, pirates, romance, betrayal and deceit you'll find that here! There were so many twists and turns and never a dull moment in this book. If you liked Song of the Current I highly suggest you read Whisper of the Tide you'll love it! I couldn't put this down and it is one of the be This was a wonderful end to such an adventure! If you're looking for adventure, politics, pirates, romance, betrayal and deceit you'll find that here! There were so many twists and turns and never a dull moment in this book. If you liked Song of the Current I highly suggest you read Whisper of the Tide you'll love it! I couldn't put this down and it is one of the best sequels and satisfying ends to a story I have read in a long time. The story follows Caro as she tries to navigate through the mess of her life after it got turned upside from meeting Markos. She was thrown into a life full of politics, piracy and an unimaginable fate. Caro is such a fantastic character shes strong, cocky, sure of herself, funny, determined and best of all shes flawed! Flawed characters are always the most entertaining because they tend to make horrible decisions which always leads to disaster. And Caro does get herself into some pretty disasterous situations! Caro is trying her hardest to help Markos reclaim his throne after the disasters in Song of the Current. While doing this she has basically given up her one true love: Sailing. When Markos is faced with a hard decision that could help him win back his throne Caro makes the decision for him. This decision leads Caro on an adventure and disaster of a lifetime! The adventure really begins when Caro manages to land herself on a deserted island with the most unlikely person you could possibly imagine while becoming a real pirate and being chased with a price on her pretty head. She also manages to get kicked while shes down a lot, one bad thing happens after another and she cant seem to catch a break. Although its really all her fault to begin with. Caro is faced with a lot of betrayal and deceit on her journey and an opportunity of a lifetime, something that's only been told in legends and fairytales. There are two characters that stand out in the book and they are Kente and Diric Melanos. Kente is Caro's cousin who has shadow magic which is very convenient in tricky situations. Kente is also a strong determined female who is willing to put her life on the line in order to help her cousin. She has such a big heart and shes very sassy and a bit of a comedic relief at times. Then we have Diric who is a scoundrel, he's killed a lot of people and hes a true pirate. Hes basically Caro's Arch nemesis after trying to kill her mother and father in Song of the Current. He is basically wrench thrown into Caro's life in Whisper of the Tide. Poor Markos in this book is faced with a lot of difficult decisions and politics while trying to reclaim his throne. Hes trying to find alliances who believe his story and want to back him up but he doesn't seem to have much luck. That is until an offer comes in that could help him change everything, tsk tsk, some things are too good to be true. He has also had many assassination attempts on his life and they don't seem to be stropping anytime soon. While this story is at times predictable its still an amazing adventure with a wonderful diverse cast of characters. This definitely wasn’t as good as the first book. There was a lot of pining in this book and it got annoying at times. But there were some really good parts that made up for it. Had it not been for those really good parts this probably would have been a 3 star read for me. I prefer my heroines to have a better idea of what they’re doing before they do it and that was not the case in this book. She started to realize things towards the end but after one whole book I feel like it shouldn’t have be This definitely wasn’t as good as the first book. A satisfying end to a great duology. I loved these characters and all of the adventures and stakes they had deal with. Secretly hoping that at some point Sarah Tolcser will revisit these characters and give updates on their lives. That was the ending Caro deserved! Plot: Taking place a few weeks after the events of Song of the Current, Caro and Markos found themselves trying to garner support for Markos' claim to the throne. Between fending off pesky assassins and political relationships, the sea god also had a bone to pick with the young couple. Poor Caro was put through the wringer in Whisper of the Tide and the stakes felt even higher than they were in Song of the Current. What I loved about Whisper of the Tide was that That was the ending Caro deserved! Poor Caro was put through the wringer in Whisper of the Tide and the stakes felt even higher than they were in Song of the Current. What I loved about Whisper of the Tide was that it truly felt like a pirate book with Caro and company being on the run and searching for lost treasure; it was like watching Pirates of the Carribean! While the ending wasn't what I expected for Caro and Markos, I thought it was very appropriate and I could see some wiggle room if Tolcser decided she ever wanted to return to this story. Characters: I loved Caro in Song of the Current because of her strong personality and desire to find where she belonged. Caro was put in even more difficult situations compared to the first installment and her personal growth was evident. Kente made an appearance and I loved the bit of magic that she brought with her. I would love to get a spin-off with Kente going to the academy and explore more of the magic that existed in the world. The romance in Whisper of the Tide was just as swoony as it was in the first book which surprised me. I absolutely adored Markos and Caro together because they both had stubborn personalities that clashed, but they always found their way back to each other. Worldbuilding: While Song of the Current took place mostly on the river, Whisper of the Tide ventured off to the ocean and farther lands. I loved the seedy places that Tolcser explored and the different aspects to boating that Tolcser introduced me to. I thought that there wasn't as much magic in Whisper of the Tide as there was in Song of the Current which I was a bit disappointed by, but that didn't take away from my enjoyment of the story. Yep. It is as I feared: Too much melodrama, not enough swashbuckling. Nevertheless, Tolcser had me hooked. I really enjoyed about two thirds of Whisper of the Tide. The first third was rough. Real rough. Caro is land-locked and so is the narrative. Nothing kicks off until a certain buccaneer reenters the picture and suddenly it's a pirate story again. Should it have picked up much earlier? Definitely. Does Tolcser make up for it? More or less. Eventually you get the swashbuckling, but it's still bogged down by a romance that used to be fun but turned into an eye-roller. The beautiful jargon of the different groups represented in Song of the Current is completely absent in this sequel and so is a bit of Tolcser's wonderful prose I loved so much. But it's made up for with some exciting world building and suspense that made Whisper of the Tide fun from start to finish. Caro is still Caro but a bit lost in this one. Which is fine because she does eventually get out of it. It's definitely some excellent character development. Another awesome character has great development but Marko got left in the dust for sure. He's incredibly dull in this one when he was so fun and insufferable in the first. Ah well... I ship Caro and the awesome female villain of this sequel anyway. Without spoiling anything, the book ends with plenty of room for more adventures. Hopefully more high-stakes adventures out on the open sea, with naval battles and perhaps some ghostly villains. I'm just throwing suggestions out here, but Tolcser... hint hint. If you like pirates as much as I do, and you enjoyed Song of the Current, Whisper of the Tide doesn't disappoint. It might at first, but stick around. It gets pretty damn good.